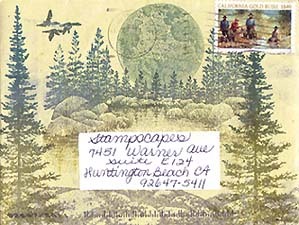 Images: Envelope: Earth by Company unknown. Lakeside Cove Lg 049G, Pine Tree 196F, Boulders w/Lichen 205F, & Duck Trio in Flight 023A by Stampscapes. 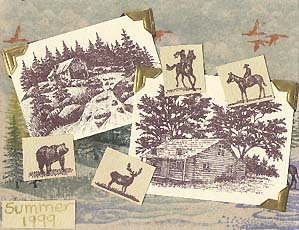 Card: Duck Trio in Flight 023A, Buck 008A, Bear 167A, Lady on Horse 168A, Horseback 173A, Cabin 140E, Old Mill 062E, Waterside Bluff left 148F, Waterside Bluff right 149F, Tree Duo lg 086B by Stampscapes®. Note: A unique personal approach to this card by Kathy made even more special by her accompanying words.